While, normally I do try to avoid discussing my undergarments, I thought, given yesterday’s adventures, that you’d like to know that I did go shopping and am equipped for getting through the weekend. Although still finding the experience creepy, the story of it amuses me. You know what I mean about the difference between the two? Besides getting to see boatloads of friends, I also specifically got to hang out with Genevieve Valentine, who helped me get the underpinnings of my Regency dress situated correctly. With all the layers, I’d been having some trouble having too much bulk at the shoulders. The secret, it turned out, was to wear the chemise and bodiced petticoat slightly off-the shoulder. Problem = solved. 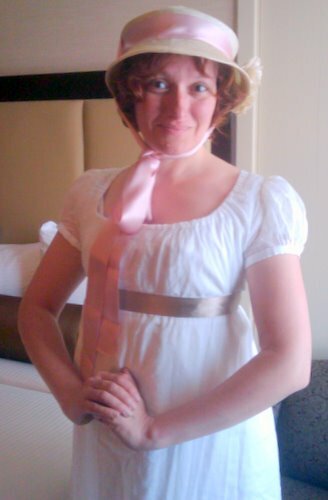 Oh, and I did decide that I’ll wear the Regency dress at the Tea/Dessert Salon on Sunday. I also got to hang out with my friend Rob Kimbro, who I worked with on Tempest back at McCarter Theater. He’s awesome and just happened to be in town at the same time. We caught up on the past and talked about the Secret Project we are working on. I’m flying out on a redeye tonight to Wiscon which looks like it will have a fun blend of people present. Hope to see you there. Established authors are invited to read from their earliest works. It’s inspirational to discover that no one is very good when they’re 14. Come and laugh, and join in the discussion of growth and craft. A reading from the anthology Chicks Dig Time Lords, which explores women’s reactions to the British TV series Doctor Who. Is Science Fiction Keeping Up with Science? Are we as Science Fiction writers keeping up with science or are we only following older models of science fiction? Can we have space travel without instant FTL? Come and sign your works, come and get things signed, come and hang out and wind down before you leave. I’m just there because it’s a good chance to catch everyone in one room. Having clerks in electronic stores treat me like I don’t know what I’m talking about is particularly annoying after Wiscon. There are times when it’s amusing to go into a hardware store in a dress and ask for a replacement blade for my bandsaw while the clerk’s head spins with reevaluation. Today, I just needed a cord and was in a hurry. I went in and the clerk asked me if I was looking for something in particular. “It’s a G1.” I refrained from rolling my eyes, because, you know, maybe he was covering for not knowing what a mini-usb plug looked like. By this point we’ve stopped in front of a display of cords so I pulled the phone out and flashed the port at him. I looked at the package again, just in case, and showed him the words “USB to mini-USB,” which is what I’d asked for. Now see. I’m glad I didn’t hand him his head for assuming that a woman wouldn’t know what she’s asking. Clearly the problem was just that his primary qualification is that he’s not a zombie. Yesterday I woke spontaneously at 9:00 a.m., which I did not approve of. I’d had so little sleep the night before, that it just seemed unfair and yet I was wide, wide awake. So fine. I got up, took a shower and eventually wandered out to the farmer’s market with my roomie Heather Lindsley. We acquired breakfast and discussed the relative merits of a theater career track versus a literary one as well as wondering why everyone in Madison ambles instead of actually walking. The rest of the day seemed to consist of meeting very cool people for food or drinks, interspersed with a nap. I didn’t manage to make it to any panels at all which is a shame because Wiscon has really good ones. I’m going to try to remedy that today. Speaking of which, I should head out and hit the con. And I’m even more thankful that I had very smart panelists in Carrie L. Ferguson, M. J. Hardman and Deepa D. so I didn’t have to do more than ask the occasional question. What was the panel? Many of us can point to something which we read that changed our lives. Some of us view writing fiction as a political act. This panel will explore the relationship of SF/F to society and culture. 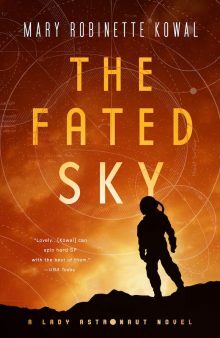 Can SF/F change the world in a practical and political way? Is there any occasion when writers of SF/F can justifiably claim it is only entertainment and has no responsibility for commenting on popular culture. Oh, I also managed to catch up with Erin Cashier, who was in the writing workshop I didn’t get to this morning, and go over her story with her. A hearty thank you to K. Tempest Bradford who stepped in to cover the workshop for me. I’ll see you at Wiscon, one of my favorites. My flight was further delayed, but that was just fine. I sat down and this charming gentleman settled into the seat next to mine. I noticed that his reading material was Naomi Mitchison’s Travel Light, from Small Beer Press. Naturally, this merited comment, as it made it almost certain that he was also coming from WisCon. Indeed. My seatmate was Ron Serdiuk from Pulp Fiction Press out of Australia. We knew so many people in common that it was almost comic that we hadn’t met before. The flight seemed almost too short, so we shared a cab into the city. I must say, I was not expecting the flight home to be one of the highlights of the trip, but it was. I’ve added WisCon to my must-do conventions. You can tell that I liked it because I came to bed too late to write a post every single night I was here. The panels were, on the whole, good. There were times when I wanted them to dig a little deeper, but the subject matter was interesting and not topics that one normally sees at cons. My jaw dropped. She’d spotted my name on my luggage tag as we were standing in line. And this, my friends, is a good reason to have a distinctive name. “Jane Austen with magic!” I said. Have the elevator pitch ready. I mean, now I’ve got a free round-trip ticket from the airline and had the bonus of making a connection with an editor right before she reads my manuscript. I think that’s worth the price of being late to WisCon. This should be some good writing time. Not that I have anything terribly exciting to report. I just wanted you to know where I am. I’m supposed to arrive in Madison at 9:08. We arrived in Avon at around 8:00 local time. Rob’s brother, Kevin and his wife Shawna greeted us. We have been plied with wine and Shawna’s delicious cooking. I took a shower and feel much more human. The cats are ensconced in our room. They seem have settled into the routine nicely. Maggie tends to stay in the “upstairs apartment” which is the open carrier on top. Marlowe alternates between the downstairs and “the cave,” which is the area under our seats. I moved a bunch of stuff to the rear of the truck, since we weren’t using any of it, so that he had more room to hang out. He still gets freaked out by being outside during the day, but last night was hankering to go out. We had them both tied to our luggage inside the tent until we got settled. Today, I even got them both to play a little bit with string. I don’t know what they make of the whole trip, but they are being remarkably adaptable. We’ll see how well they let us sleep tonight. I am dragging and looking forward to a day of being stationary. We’ll stay here in Avon until Monday, when it is off to Wisconsin.